Check Out Our Repair Shop for Low Prices! Coppins Service Center is an automotive repair service shop that always keeps your best interests in mind. Since 1937 we have provided outstanding customer service to Lewiston, NY and the surrounding community. Coppins Service Center offers 24-hour towing service. We are also a service provider for AAA. We offer only the best brands of tires for sale. You can even have your car inspected while you wait. New York State Inspections are just one of the many specialties we provide here at Coppins Service Center, and customer service is always a priority. Coppins Service Center, located at 550 Center Street in Lewiston, NY, offers much more than car repairs. We are also a well-known tire dealer in the area that offers consistently low prices on all our products. In addition, our great customer service stands out above the rest here in Niagara County. Your vehicle is important to you. When something happens to it, you don't want to rely on just any car repair shop to take care of it. Put your trust in Coppins Service Center for the most reliable work in town. Our skilled mechanics retain years of training and experience. We will cut to the root of the problem in no time at all. Locally owned and operated by four generations of the Coppins family, we are a full service Mobil gas station, specializing in NAPA auto parts. Inspections are particularly hard to pass in NY. Come to us for your next New York State Inspection, and we will send your vehicle home in tip top condition. We all know that the police are always on the lookout for that colorful sticker in your window. Come to us for your inspection renewal as well! Coppins Service Center is an automotive repair shop that specializes in auto brake repair, towing service, cheap tires, vehicle inspection, tune up work, and front and rear tire realignments. We can also repair suspensions, alternators, and starters. Additionally, we provide your vehicle with oil and lube, filter service, and battery service. If you are experiencing problems with your tires, exhaust, struts or A/C, bring your vehicle in today. 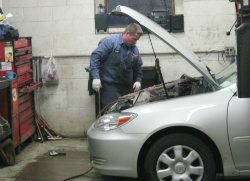 Our mechanics are fully trained and experienced in all areas of automotive repair. Don't forget to check out our Mobil gas station while you're here. With over four generations in the business, we are the most convenient and reliable tire dealer located in the heart of Lewiston. Our professional team is efficient and friendly. We will never make repairs without your consent or permission, and we never charge you with hidden labor fees. Whether you need all-season tires or special snow tires, don’t hesitate to contact our shop today. 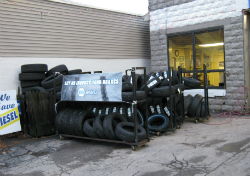 Visit us at 550 Center Street in Lewiston, NY, or call us for tire specials and promotions at (716) 952-4426. 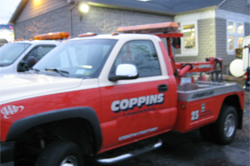 Coppins Service Center is proud to serve Lewiston, NY and the surrounding area with an elite 24-hour towing service. We know things happen that are beyond your control, which is why we want to be there for you and provide the most efficient and reliable towing service. You never know when or where you might have car trouble, so we will be there any day and any time. We offer a wide range of automotive services at prices that won't burn a hole in your pocket. Our services include auto repair, brake repair, auto inspections, towing service, and more. We serve customers in Lewiston, NY and the surrounding areas. We are a trusted company and can help solve your car trouble quickly. Plus, in an emergency, you can rely on our team to assist you with towing service. Keep our number saved in your phone! We proudly serve the Lewiston, NY area with all your automotive repairs and towing needs. We are open Monday through Friday from 8 a.m. to 7 p.m. Your ultimate satisfaction is our foremost priority. Our automotive repair business represents four generations of Coppins ready to serve your automotive repair needs. Whatever your needs are, please choose Coppins Service Center to help. Call us today at (716) 952-4426 or visit our website for more information.